The in basket: Norm and Karen Kunkel are concerned about how much of Ridgetop Boulevard uphill from Highway 303 is a school zone. They said they saw a yellow pedestrian crossing sign depicting what appears to be a woman and a child, posted just west of Hillsboro Drive and an “End of School Zone” sign just past the intersection and concluded it was a school zone. Karen told me they have been going 20 mph from there all the way up to the actual school zone at the street leading to Emerald Heights Elementary, even though there are 35 mph speed limit signs posted there. She said she has talked to people who have gotten a school zone citation somewhere in there. The “End of School Zone” sign just past Hillsboro no longer is there, Norm said last week. I asked the county where there are school zones on Ridgetop, what the yellow two-figure sign denotes, and if signage on that stretch of Ridgetop Boulevard had recently been changed. The out basket: Jeff Shea, traffic engineer for Kitsap County says, “The only school speed zone on Ridgetop Boulevard is on either side of the intersection of Pinnacle Court leading to Emerald Heights Elementary School. There is no school speed limit zone at Hillsboro. “The School Sign (it is actually 2 students, not an adult and student) which looks like an old school house (5 sided; floor, sides and roof) is actually a warning sign alerting motorists that a school or school crossing is nearby. It is to warn motorists that they could see school-age children on or near the roadway. It does not require the motorist to reduce speed. “The posted speed limit is the legal speed. Not until you see a rectangular sign with a school speed limit 20, and flashing lights, times, or “when children are present” placards does the speed limit change. “We recently revisited all school zones county-wide. Some changes to the Manual on Uniform Traffic Devices triggered sign modifications. The end school zone signs were removed because motorists don’t actually go through the school speed zone. The directional arrow below the School Sign is new to the MUTCD and denotes that the school zone is around the corner on Hillsboro. The in basket: Nancy Fuller-Hall wrote, “I moved to 282 Farragut Avenue in February. Who is responsible for the Farragut road? As you can see the area where we live is a mess but just up the street the guard rail and street is nice and neat. 2) response to citizen complaints. 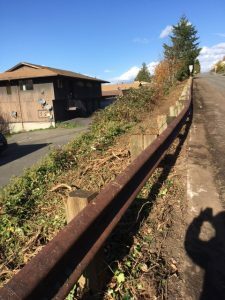 “For the prior, roadside vegetation control with our roadside vegetation mower is a constant from early Spring to Fall ….but guardrails require hand labor (weed-eater) and we keep up on those as best as we can. He asked one employee to add the Farragut complaint to the Complaint Log and another to schedule the work. Having recently met a local trooper named Matt, I asked if it was he calling. After about 10 second of silence, “Matt” resumed, giving no indication that he’d heard my question. So I asked again. Another period of silence, and the voice resumed, again giving no sign I had asked anything, but seeking a donation. I listened long enough to determine that the solicitation seemed legitimate, as he asked permission to send out a donation packet with information on the association. I hung up. I asked Trooper Russ Winger, my local WSP contact, if it WAS on the level, and whether the trooper named Matt that I had met was the one who called. Also I asked if this was some kind of anticipatory robo-call that presumes to predict what the person called will say and includes a stock one-size-fits-all answer that somehow disguises the fact it’s not a real person calling. And if it was legitimate, why choose such a oddball way of making the request. The out basket: Yes, it was a legitimate solicitation from the troopers’ association, Russ said. He didn’t know anything about the technology behind the call, but gave me the phone number of the company on the east coast that conducted the campaign. Matt turned out to be Matt Crow of Ellis-Crow Solutions, and he said he remembers that day (two days, actually) when he was unable to hear what the person called said though they could hear him. “We had a lot of issues and as the day progressed, it got worse and worse,” he said. There were a lot of such calls, so some of you reading this may have gotten one and wondered what on earth it was about. They use something called Voice Over Internet Protocol to make the calls, Matt said, and those two days it malfunctioned. Though he didn’t seem to be getting any response on the line, he plunged ahead with his spiel, with me, anyway. The association has a Web site if you want to know more about it. It’s a collective bargaining organization, but also donates to a variety of benevolent groups, the site says, and just now is promoting a GoFundMe campaign on behalf of a WSP employee’s daughter with a rare form of cancer. The site is wspta.org. 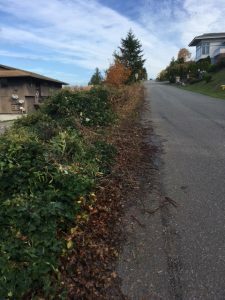 The in basket: Bob Carter, who complained to the Road Warrior last spring about storm water allowed to flow down Riddell Road in Bremerton during heavy rains, writes again to say, “Paving on Riddell Road between Pine and Highway 303 was just completed. There had been a problem with water on the roadway during a hard rain storm. “After the paving, there seems to be still a water problem on the roadway during a rain storm and it starts up by Peace Lutheran Church. The water from the culvert under the driveway going to Peace Lutheran Church needs to be contained and routed to a drain before it enters the roadway which causes hazardous driving. “Now most of the water enters the roadway and some of the water flows downhill and enters the parking lot at Redwood Plaza with excess water depositing sand/gravel in the parking lot and it also has created standing water as you enter the Redwood Plaza parking lot by Bank of America. “The exit to the parking lot was filled in with asphalt but the entrance side was not. The new paving did, however, improve the water on the roadway at Riddell and Highway 303,” he said. The out basket: Colen Corey of Bremerton Public Works, says, “We added some catch basins to catch water in the right of way east of the church so that there is less water traveling the entire distance on the road surface. “We have not completed the various tasks associated with this project yet, such as some shoulder work, paving of driveway areas and completion of lane channelization. We will accomplish these tasks this fall/winter as time allows. “This area is very flat and the surface water does not move very fast, causing the perception of a lot of water in the roadway during heavy rain periods. However, the new drainage is working good and handling storm water as planned.